You toured the nursing home facility, you met with the administrators and chose the Florida nursing home that would care for your loved one. But then, late one evening you receive a phone call that your loved one has suffered an injury that was caused by an unsafe environment in the nursing home. What do you do next? Who will be held responsible for your loved one’s pain and suffering, for their emotional distress, and how can you make sure that this kind of horrible experience does not happen to another family? You can pursue the civil remedies available to you and hold those responsible for your loved one’s injuries accountable for their negligence. At the Yeboah Law Group, our experienced Fort Lauderdale nursing home negligence attorneys are here to demand justice on your loved one’s behalf in the form of fair compensation when their injuries are the result of the negligence of the nursing home staff that was charged with taking care of them.  From the moment your loved one signs the agreement with the nursing home to become a resident, he or she entered into an agreement that is governed by state and federal law. Nursing homes receive federal funding, but to keep receiving that funding they must comply with the law. Federal law includes a bill of rights and protections that residents of nursing homes enjoy along with protections under Florida law. Nursing home residents must receive notice of their rights and responsibilities in a language they can understand. 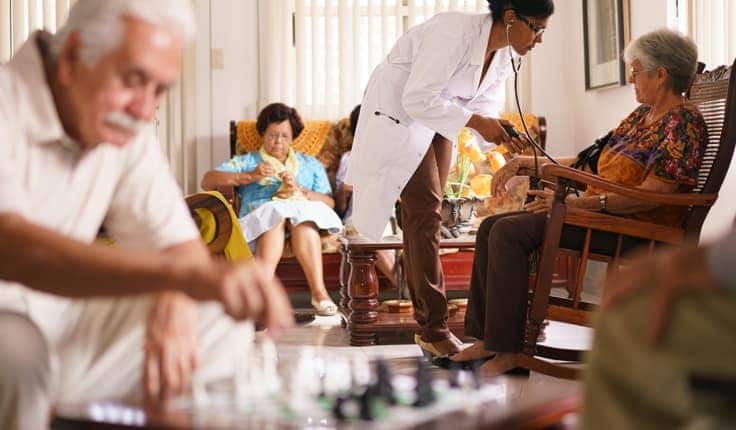 An essential aspect of providing an acceptable level of care for nursing home residents is the environment and living conditions for the residents. A safe environment is clean and well-maintained, there is an adequate number of properly trained staff to meet the needs of the residents. When you walk through the hallways there are no foul odors, and residents’ rooms are kept clean and maintained in a safe and sanitary manner. Other important aspects of a safe environment include floors that are kept clean and dry and free of debris that could become a tripping hazard. Extreme temperatures can be devastating for the elderly. High temperatures can create problems for seniors who have health conditions that inhibit their bodies’ natural ability to perspire and cool off, or their ability to maintain their body temperature. When it is too hot, the elderly can be vulnerable to heat stress, heat stroke and dehydration. Very cold temperatures are just as dangerous as elders are vulnerable to hypothermia. Nursing homes should have backup power systems so that they can continue to maintain a safe temperature should a temporary power outage occur. During times of extreme heat or cold, staff members should check up on all of the residents to see if they need any help, if they are overheating or if they are too cold and need to be wrapped up in a blanket. If you see an unsafe condition while you are on site at a nursing home visiting your loved one, where someone has been hurt or a crime has been committed, you should dial 911 immediately. If it is something that poses a hazard, but is not causing any harm or injury at the moment, you may bring it up with the nursing home administrator. You can also file a complaint with the Florida Agency for Health Care Administration’s consumer complaint line: (888) 419-3456 / (800) 955-8771 Florida Relay Service (TDD number) You may also complete a Health Care Facility Complaint Form and submit it. If you visit Florida Health Finder.gov, you can find out if the facility is regulated by the FAHCA. If your loved one has been hurt due to an unsafe environment in a nursing home, we are here to protect their rights and to fight for compensation for their injuries. We investigate the incident and the extent of their injuries and we determine whether the cause of the injury was negligence on the part of the nursing home staff. 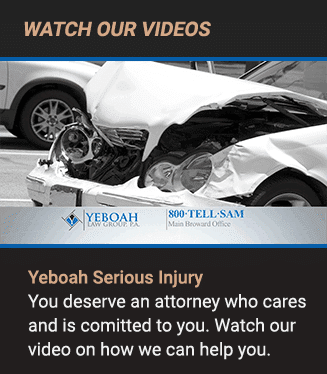 At the Yeboah Law Group, we are here to help you obtain justice for injuries caused by nursing home abuse and neglect. If you believe that it is time to hold those who caused injury to your loved one responsible and accountable for their pain, the medical bills, the future care and any other losses suffered as a result of nursing home abuse and neglect, we are here to help. At the Yeboah Law Group, we know that it is not easy to pursue a lawsuit against a nursing home, but we are here to protect the interests of your loved one and to make sure that you recover all of the compensation you or your loved one deserves when nursing home negligence leads to injury. We encourage you to call now at 1-800-TELL-SAM or complete our contact form for a no-cost consultation.